Independent producers are getting legal advice on whether they can hold the Independent Communications Authority of South Africa (ICASA) to account for failing to adequately monitor the amount of local content on our screens. According to Marc Schwinges, vice chairperson of the SA Screen Federation (SASFED), research undertaken by independent producers themselves appears to indicate that the all-important quotas could be short by 10 to 20 per cent. This could translate into a loss of commissioned programming worth millions of rands for the industry, which has suffered hard times due to the on-going management and funding crises at the state broadcaster. The SABC is by far the country’s largest consumer of locally produced content. “ICASA has not done their mandated duty in terms of ensuring compliance with local content quotas,” says Schwinges. SASFED, supported by a wide body of interested parties, agreed to explore legal options in an AGM last year, but thorough research was necessary first (it is now nearing completion). ICASA is supposed to report regularly on compliance with quotas, but Schwinges says that only one report has been produced in the last nine years, and that it “basically concludes that [ICASA] does not have sufficient data to quantify the accuracy of anything the SABC is telling them”. ICASA has admitted to parliament that they do not have the necessary equipment to monitor compliance with the quotas, which amounts to 55% of content from 4am to 11pm each day on SABC channels 1 and 2, and 35% on SABC 3. ICASA spokesperson Paseka Maleka confirmed that purchasing new equipment needed to enable more accurate monitoring had been “in the pipeline” for some time, but had not yet arrived. Maleka says that presently, about 10 staff members work on monitoring content. They do spot checks to ensure quotas are met, and that no more than 12 minutes of advertising is flighted per hour. They also assess quarterly reports supplied by the SABC, which have been submitted consistently. However, he agrees that “since the Authority [ICASA] did not have a monitoring system in place, it has been difficult to compile a compliance report based on the analysis of quarterly reports [provided by the SABC].” ICASA then “decided to use any possible solution at its disposal” to monitor compliance. The last complete compliance report was for 2008/09 and only monitored SABC TV recordings from September to October 2008. ICASA did not supply a copy of the report despite a request. “The report is by no means an exhaustive account of SABC”s annual compliance with its licence terms and conditions,” Maleka says. As it covered such a short period, “the Authority cannot conclusively deduce that the SABC did not comply with its … local content quotas” – or in other words, could not say it did. Monitoring for the 2009/2010 report has been completed, Maleka says, but there is no timeline available for its release, and until it is finalised, he can’t comment on whether the SABC complied with the quotas or not. The 2010 SABC annual report, which looks at performance measurement for 2009/2010, says the broadcaster met ICASA quotas and “all mandate content required [was] delivered fully except for TV’s marginalised languages”. This was due to the “production industry’s lack of capacity and competence in producing content in marginalised languages”. SABC spokesperson Kaizer Kganyago this week referred the Media Online this week to the annual report and declined to comment on ICASA’s monitoring mechanisms. Kganyago said that the SABC submitted quarterly reports to ICASA, had submitted its last report in April (for the period April 2010 to March 2011), and had met the quotas. Do local content sums add up? Calculating local content is a complex job, and there are concerns that it is not being done correctly. All minutes of shows aired for the first time count towards the quota, but a first rerun counts just 50% of time, while subsequent flightings cannot be counted, says Schwinges. Sport doesn’t count, and neither do commercials. Bonus points can be earned for programmes made outside the major cities, BEE-compliant companies or programmes made in the more “marginalised” of South Africa’s 11 languages – but monitoring this adequately is a nightmare, and figures can be abused. Both Skinner and Schwinges felt more transparent and accurate data needs to be supplied by the SABC. 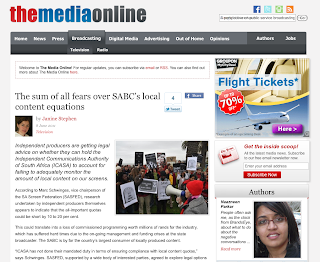 “The SABC annual report should give a lot more information than it does,” says Skinner. Maleka says the SABC does submit “accurate data” and usually highlights when it was unable to meet (or where it exceeded) quotas. “The Authority has an obligation to analyse, therefore verifying the quarterly submissions against own monitoring,” he says. Independent Producers Organisation representative Harriet Gavshon agrees that ICASA needs to ensure quotas are met. She says that there is still very little new commissioning happening at the SABC – and budgets are lower than before, with heavy prescriptions on how funds can be spent. A current key issue for producers is the delay in the release of the Requests for Proposals book (RFP), which outlines projects for producers to bid on and is meant to encourage transparency in the commissioning process. “We’ve been waiting since December 2010 for the last RFP,” Gavshon says. However, she says she understands the SABC needs to manage their content flow more closely and says there has been communication with the industry on the issue. He does however, feel that a delayed bid book is better than producing one, and then have producers waste resources to bid, only to find that projects don’t get off the ground due to lack of funding. Kganyago said that the SABC would communicate with the industry around the timeline for release of the RFP book “in due course”.